Joseph Aubrey (Joey) McDonald was born and raised in Dillon County, SC. 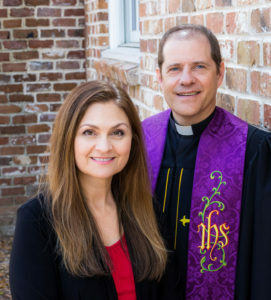 He received his Bachelor of Science Degree from the University of South Carolina and his Master of Divinity Degree from Erskine Theological Seminary. He was ordained as a Full Elder in the United Methodist Church in 1998. As of 2017, Pastor Joey is serving his 23rd year in pulpit ministry. Prior to coming to Bluffton, Joey served three charges: St. Matthew Circuit, Cambridge and the Barnwell/Siloam Charge. All of these charges are members of the South Carolina Annual Conference of the United Method Church. Pastor Joey and his bride Mickaylla were married on July 13th, 2010. Mickaylla, a former speech language pathologist is presently a stay at home mom. Together, they have five boys: Mark – 21; James – 18; Josh and Zac – 19; and Mathew – 15. Contact information for Rev. Joey is at the bottom of all pages on this website.